You don’t have to settle for low returns just because you are stock-trading part-time. Sure, day trading is difficult. And it’s even more challenging if you’re not investing sufficient amount of time. But again, it isn’t impossible. And it doesn’t have to be like that, even for the beginners. 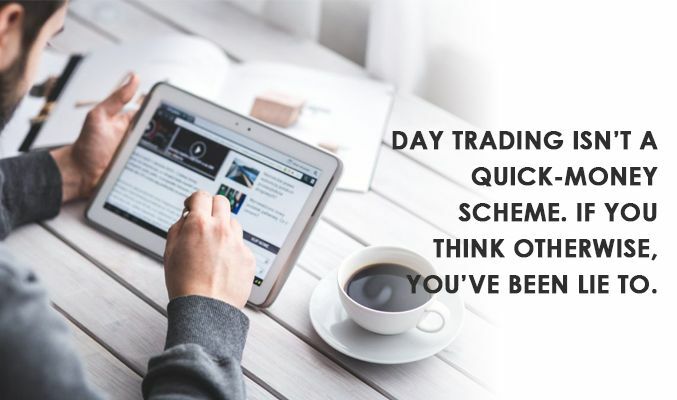 Day trading isn’t a quick-money scheme. If you think otherwise, you’ve been lie to. It takes time. It takes a lot of time. You won’t make big money right from the first day. It’s a process that needs to be followed step-by-step. You must spend time in the learning part. Following, you must make trades; a lot of them will do you loss. Also, given it depends on so many diverse factors, finding the right trades all the time is not always possible. All in all, you need to have enough patience. Be patient to wait, observe the market, sustain losses, observe some more and get things right. 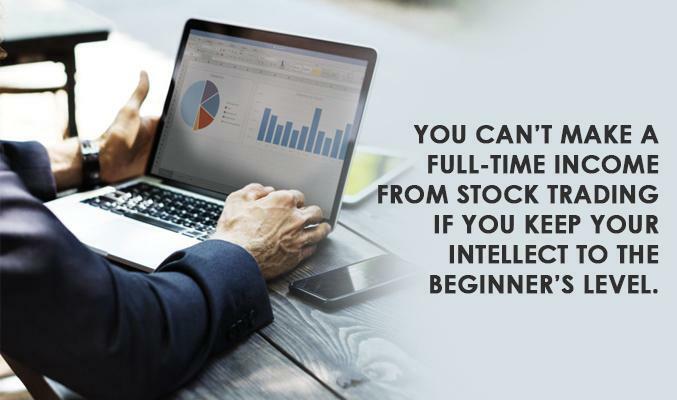 You can’t make a full-time income from stock trading if you keep your intellect to the beginner’s level. Period. Successful trading requires the right amount of knowledge and experience. It demands you grow every day of your life, learn new things, understand the technical aspects of trading. If you’re a complete newbie, enroll yourself in stock market courses for beginners before you start your trading journey. Even if you’re someone experienced, to expand your horizon, opt for stock market trading courses of advanced levels. The more you learn, the better will you understand the market correctly. And that is when your decision-making will become so much more efficient. This is not essential. But it’s highly helpful and recommended. If you have a role model or mentor, you can easily follow that individual and create a path for yourself. They have already done what you’re trying to achieve. So, all you’ve got to do is copy their strategies and approach. And you will reach your destination quickly and, comparatively, easily. Now, of course, picking the right role model is easier said than done. So, do intensive research work here. Pick someone who you know (not necessarily personally) and can rely on – someone who has a successful track-record of stock trading, someone whose stories you can relate to. There are many such bloggers and consultants out there. It isn’t about waking up in the morning and going “what should I do today”. Stock trading requires planning and strategy-making. Else, there’s a good chance you will enter the over-trading territory, completely wrecking your money and risk management strategy. To keep impulsive trading at bay, set a few rules as to what dos and don’ts are on the given days. Set price alerts to stay ahead in the game. At large, know what you’re doing and what you should be doing next based on a well-thought plan and not emotions. It’s a long journey of starting, failing, learning, and winning. The latter three never stops BUT cycles for as long as you’re in the game. As a stock trader, it’s essential that you’re open to learn from your mistakes. You must proactively look out for all the errors and blunders you have committed. And then make sure you don’t do the same thing the next time. This also means that you don’t always focus on the wins but also greatly prioritize your losses. Since you’re busy during the weekdays in your day job, all you have are your weekends. Make the most of your Saturdays and Sundays. Plan your trading strategies at the weekend. Look at your past journal to learn more. Review your winning and losing trades of the previous week. Read charts and news on Saturdays and Sundays; do technical analysis. Assess your price alerts. Reset your stop-loss, take-profit positions. In short, be careful of how you spend your weekends. Don’t waste them senseless. If you’re really serious about stock trading and building a fortune from it, you have to go full-time someday. The transition won’t be easier indeed. It’s going to be risky and you will be scared. Leaving your comfortable full-time job for something as risk-prone as trading is not supposed to be easy. But then you have to do it. Lookout for the right moment. Make sure you’re decently experienced with the game, understand the market correctly and, above all, you enjoy trading. Also, keep an eye on financial stability; meaning, ensure you have enough savings in the bank account to cushion the shock of leaving your full-time desk job. These are 7 tips to make a full-time income from your part-time stock trading. Again, it’s not going to be simple. You will face a lot of challenges on way. And you will lose money—a lot of it if you’re a complete beginner. But all these will be worth it once you have championed the game. Just have patience, be open to learn and take the right risks whenever needed.